Stadium: Spectrum Stadium, Orlando, Fla. 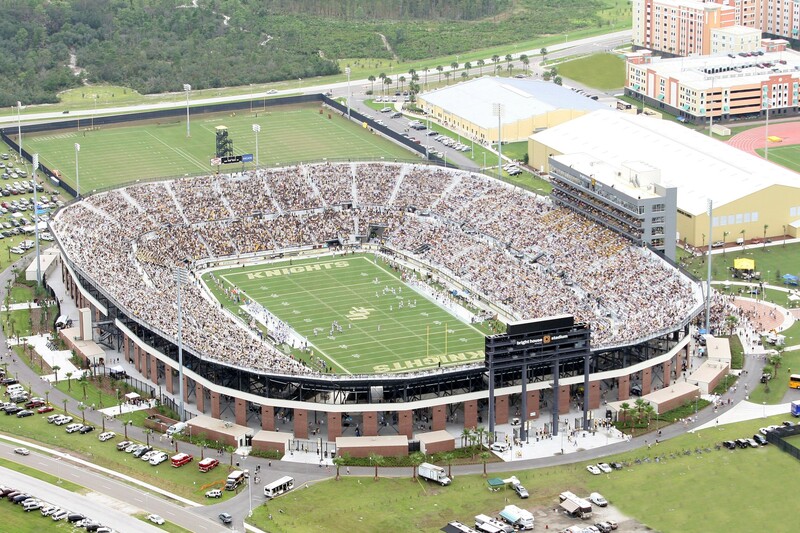 The Memphis Tigers and UCF Knights meet Saturday in the college football AAC Championship at Spectrum Stadium—the home field of the Knights. The Memphis Tigers have a chance to win 11 games for the first time in school history while earning their sixth conference title. The Memphis Tigers have won three straight road games to this point in the season. Riley Ferguson is completing 62.2 percent of his passes for 3,500 yards, 32 touchdowns and eight interceptions. Ferguson has three or more touchdown passes in five of his last seven games. Anthony Miller and Phil Mayhue have combined for 1,648 receiving yards and 16 touchdowns while Tony Pollard has 28 receptions. The Memphis Tigers ground game is averaging 202.4 yards per contest, and Darrell Henderson leads the way with 1,045 yards and eight touchdowns. Defensively, Memphis is allowing 30.8 points and 453.5 yards per game. Austin Hall leads the Memphis Tigers with 74 tackles, Genard Avery has 6.5 sacks and Terrell Carter has four interceptions. The UCF Knights hope to continue their perfect season while winning their fifth conference title in school history. The UCF Knights have won six straight home games. McKenzie Milton is completing 69.1 percent of his passes for 3,301 yards, 30 touchdowns and six interceptions. Milton has a combined 10 touchdown passes and one interception in his last three games. Tre’Quan Smith and Dredrick Snelson have combined for 1,432 receiving yards and 16 touchdowns while Jordan Akins has 26 receptions. The UCF Knights ground game is averaging 198.3 yards per contest, and Adrian Killins, Jr. leads the way with 711 yards and nine touchdowns. Defensively, Central Florida is allowing 22.5 points and 399.1 yards per game. Pat Jasinski leads the UCF Knights with 83 tackles, Shaquem Griffin has 3.5 sacks and Kyle Gibson has four interceptions. UCF beat up Memphis in the meeting back in September, 40-13, but the Tigers are a different team right now, as the defense has improved and the offense has scored no less than 41 points in the last five games. Last week was the play-in game for the Florida teams when UCF beat USF to get into this play-in game. And now, barring something crazy from the Mountain West, the winner of this game will get the New Year’s Six bowl invite on Sunday. UCF has the offensive firepower to match Memphis, but I also trust the Knights defense more than I do the Tigers. I will take the Knights by double digits in this contest as they complete the 12-0 season. FAU won the earlier season meeting in impressive fashion, defeating the Mean Green 69-31.The Owls gained more than 800 yards of total offense. This one will be closer but not by much as Lane Kiffen will get a conference title. The Rockets will take a close look at the game film from the 48-21 win Oct. 21 against the Zips at the Glass Bowl. But a lot has changed since. In the fourth of four rematches for the G5 conference championship games, the Bulldogs must travel to the Broncos this week. The computer polls that the MWC gave Boise State an average position of 30.25 while relegating Fresno State to an average of 34.25. Meaning the Broncos get to host the conference championship – even though the two teams finished the regular season with identical records (9-3 overall, 7-1 MW) and the Bulldogs were victorious in an actual, honest-to-goodness contest of football.